Royal Flying Corps message streamer. Manufactured in panels of different coloured silk or woven cotton with a small pocket at the end designed to house a message and weight. 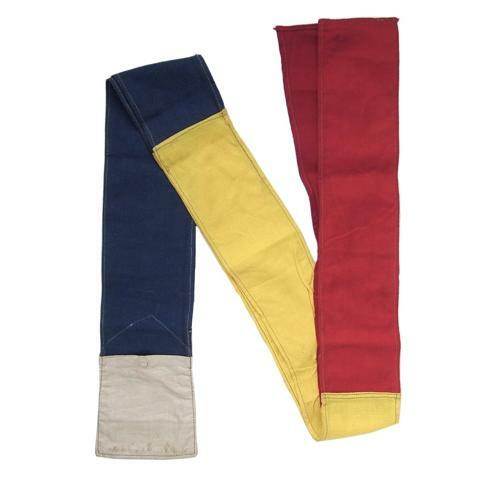 These streamers were dropped from aircraft over aerodromes and troops in the trenches in order to supply reconnaissance information to those on the ground. Overall length approx. 1.37m. Superb bright colours and in excellent condition. Similar examples can be seen at Hawkinge, RAF Hendon and Cosford Aerospace museums and also at the warfare museum within Edinburgh Castle. Stock code M21828.